The pace was high off the opening puck drop, but neither side generated much in the way of offense through the opening five minutes. 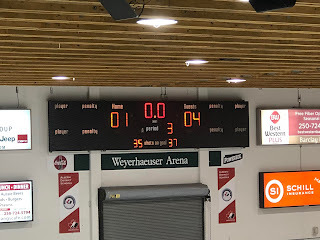 The Bulldogs didn't have a shot on goal, but almost had a goal on several instances as a centering pass hit a Capital defender skate and just missed the post, while Ryan Miotto settled a loose puck on a breakaway but couldn't get a shot on net. The Capitals would run up a healthy edge in shots, but the Bulldogs didn't give up much if any chances, as John Hawthorne kept it scoreless. The Bulldogs would open the scoring just over eight minutes in, as Stephen Castagna picked up a Marcus Walter rim up the left wing in the Dogs zone and put a cross-ice pass onto the tape of Mitchel Deelstra. He would race over the Capitals line into the top of the left circle where he beat Blake Wood with a quick release, high far-side over his glove to make it 1-0 at 8:06 of the first. 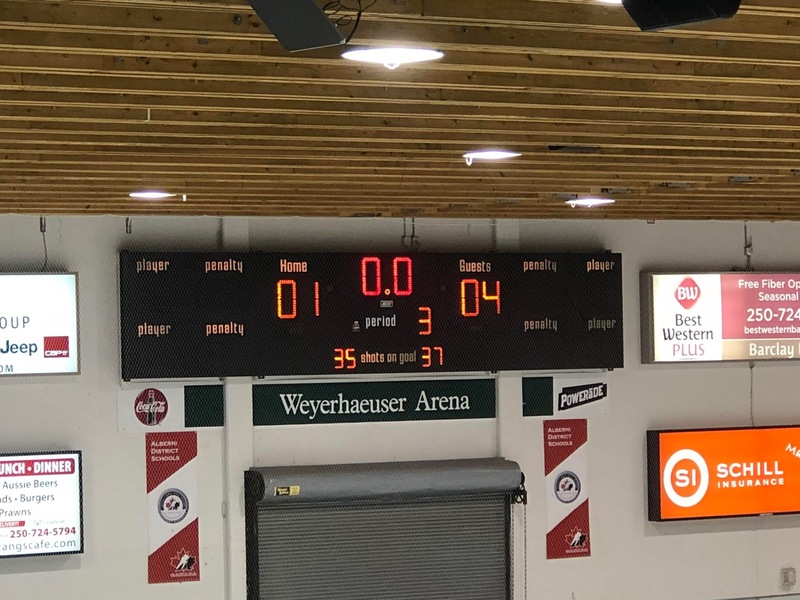 The Bulldogs went to an immediate power play opportunity on the following shift, and had several great opportunities around the the net but couldn't get one to go as it stayed a 1-0 game. The Bulldogs continued to push, but couldn't pad their lead before the Capitals got the equalizer on the rush as Dimitri Mikrogiannakis put a shot on net from the right half-wall that Hawthorne turned aside, but couldn't control the rebound as it went across the slot and onto the tape of Paul Selleck. He would put it home short-side past the blocker of Hawthorne, who made a valiant attempt to recover. Brady Lynn also drew an assist on the play at 16:22 of the first to make it 1-1. The teams traded chances to the end of the period, with Hawthorne coming up with a big save in tight on Olivier Gauthier to keep it 1-1 after 20 minutes, with the shots 16-15 Bulldogs. The Capitals had an edge through the early minutes of the second, hemming the Bulldogs in their zone for an extended period, and winning repeated faceoffs to get pucks on net. The Bulldogs continued to chase the game through the middle of the period, with the shots favouring the Capitals 8-1, with Hawthorne again solid when called upon. The game stayed 1-1 into the late stages of the second, with Hawthorne coming up with a big save on an Andrew Troy one-timer in tight from a pass from behind the goal line. The Bulldogs would manage to generate some offense later in the frame, with Blake Wood coming up with a highlight reel save to keep it 1-1 when Mitchell Deelstra accelerated over the Capitals line on a 2 on 1 up the left wing before putting a perfect pass across the slot for Evan Googins, only to have Wood get a glove on it in desperation to keep it tied. Shots in the period were 11-7 Capitals, for a 40 minute total in their favour of 26-23. The Bulldogs started the third much better than a previous two, with an imeditae scramble that somehow stayed out. They continued to push over the next few minutes, with Wood coming up with another save on the goal line on a very odd play that saw a long shot miss into the far corner, but neither Wood or his defender blocked it from coming cross-ice into the crease where it was one-timed on goal by Mackenzie Wight, only to have Wood get his right toe on it. Neither team generated much into the back half of the period, as it remained deadlocked at 1-1. The Capitals would take their first lead of the game on the rush, on a double rink-wide series of passes out of their zone from the left to right side, to the left side of centre at the Bulldog line where Dan McIntryre skated into the top of the left circle with a step where he beat Hawthorne long-side under his glove to make it 2-1, with assists to Boo Grist and Peter Tabor at 13:39 of the third. Seconds later, the Bulldogs were penalized on a high hit at centre ice. It took just 18 seconds on the man advantage for the Capitals to put the game away, as a high-low set up ended up in the slot from behind the goal line where Affiliate Player Jo Jo Tanaka Campbell one-timed a Paul Selleck feed past the glove of Hawthorne. David Melaragni also drew an assist at 14:07 of the third. The Bulldogs were unable to mount a push to make a game of it, before the Caps sealed the deal into an empty net when Olivier Gauthier chased down a loose puck in the Bulldog zone on the left wall and fired it low through a Bulldog defender to make it 4-0 at 17:57 of the third to complete the scoring for a 4-1 final. Third period shots were 12-11 Bulldogs, for a game total of 37-35 Capitals. Blake Wood earned 1st star honours with the win, while John Hawthorne took the loss. The Dogs went 0 for 1 on the power play while the Capitals went 1 for 1. The Bulldogs are next in action Saturday night when they host the Prince George Spruce Kings.